At the beginning of the last academic year I knew I had to do something productive with my summer. As well as making it useful, I wanted it to be fun, exciting and not surprisingly, meaningful. So my mind landed on working abroad, which was something I hadn’t done before but had been thinking about before becoming a postgraduate. However, I didn’t know where what I wanted to go, I just knew that’s what I should do. After looking into this, I finally landed on a work placement in India for 2 months through an organisation called AIESEC – the world’s largest student run organisation with a mantra of promoting global leadership and fostering cross cultural relations between students. I was to be hosted by students of the Indian School of Mines in the City of Dhanbad – one of India’s more prestigious engineering colleges in the ‘Coal Mining Capital city’. The focus of my internship was promoting social entrepreneurship; I did not realise the full impact and importance of this idea in India until I was there; business solutions to India’s vast social problems is a widely appreciated approach. The company I worked with: Whiz Mantra Educational Solutions LTD– works with the communities surrounding Dhanbad through improving educational conditions; working with both parents and children in the villages. As an intern my job was to assist the company director wherever possible on a day to day basis, which meant I often got to go to the sites of work and visit children at their schools or with their families. However the central part of my role was to lead a team for an event which would promote entrepreneurship among university students at the Indian School of Mines. The purpose of the event was to show students the benefits and scope for starting a business as opposed to just joining a company. Among many duties this largely involved inviting guests and speakers, making arrangements for their stay in the city, and perhaps more dauntingly, attending meetings with large scale Indian companies with the hope of obtaining sponsorship for our event. Having this public relations and business experience was invaluable, as was being in another culture where everything from the business methods down to cultural etiquette forced me to face challenges head on. There were great personal rewards for doing this. After two months of working six days a week, the event was a complete success (but not without challenges of course!). 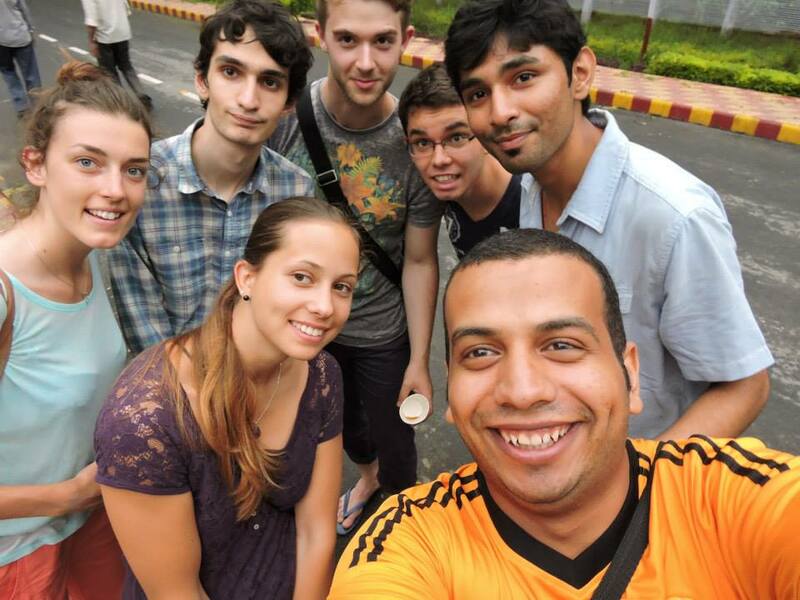 Reflecting on my two months in India, I can’t stress enough the significance of working abroad. It’s an opportunity to challenge yourself, gain valuable employability experience and greater perspective in a short amount of time. Not to mention it’s a lot of fun, especially if you don’t mind being away from comfortable surroundings for some time! But this isn’t something to be concerned about. I found myself to be surrounded by so many interesting things, sites and, of course, people so often that I was completely at ease. For more information about AIESEC and what you can do, visit their website – http://www.aiesec.co.uk/. You can go anywhere the world and do pretty much anything. All you need to do is want to do it, be open, and you’ll be more than satisfied! 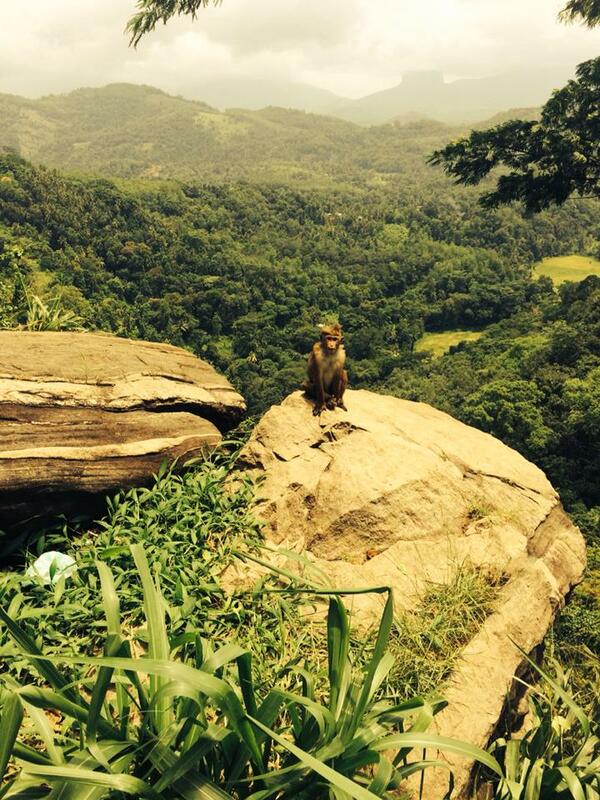 This summer I had the great opportunity of visiting Sri Lanka and volunteering with SLV, a student and graduate volunteering scheme offering a vast array of different placements. It’s not a secret to know that it is now not solely a degree which will throw you into the frontline of your ideal job after graduation, but is the ever growing experience you have under your belt. Just under a year ago I decided I wanted to do something about this, expand my CV, so when it does come down to applying for my dream job and walking into many interview rooms, I know I will have a lot to discuss. 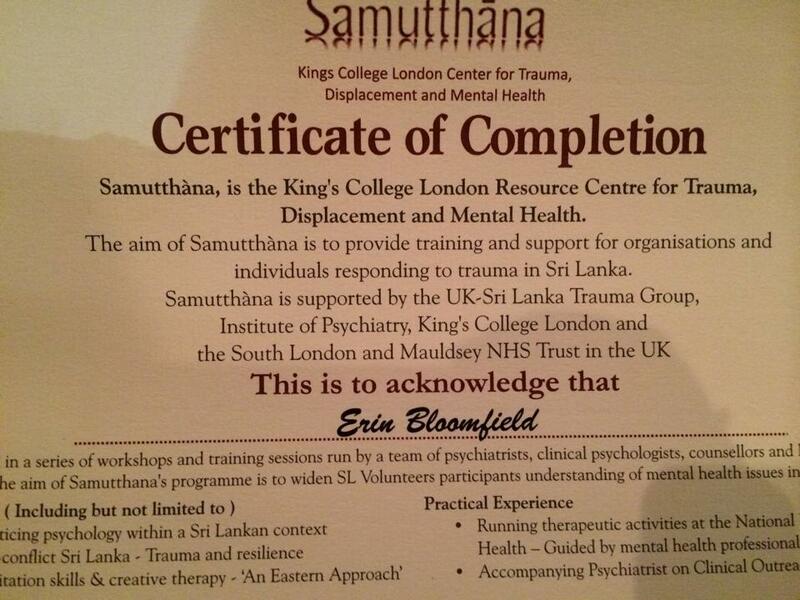 SLV are partnered with Sammuttana, the Kings Cross College resource centre for trauma, displacement and mental health. The placements range from 4-12 weeks, I chose to do the 5 week placement (which actually is no longer available). This placement I found to be an appropriate length of time as I was apprehensive of spending such a long period away from home, with it being so far. However my advice now, and if I have the opportunity to visit again, would be for 8-10 weeks. With volunteering for such a well put together and prestigious organisation you feel right at home so not once did I feel homesick. As well as this toward my last week I had grown good bonds with individuals and those in the classes I was working with, and now wish I had stayed longer to see more progression than I already did. 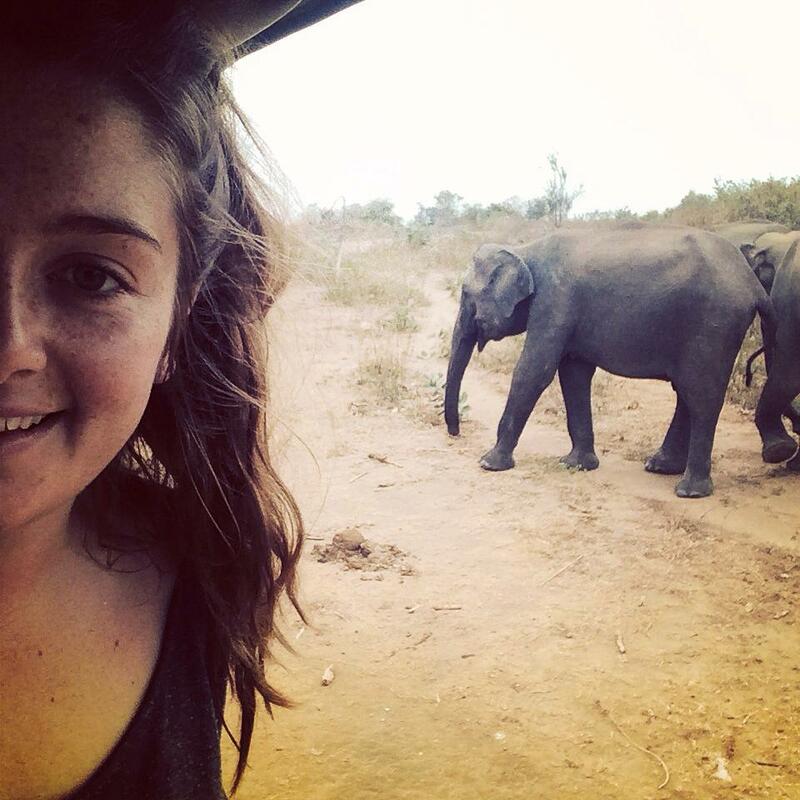 As part of the placement there was an induction week so all would not seem so overwhelming, and this gave time to get to grips with the Monday to Friday timetable, as well as an incredible trip to the jungle where I really got to relax and meet new people. This is all included in the price along with white water rafting and cliff jumping. I found in my first week I met some great friends, all of whom I spent my weekends travelling with. My Monday to Friday timetable consisted of half a day per week running therapeutic activities at psychiatric hospitals, half a day at a residential centre providing care for individuals with mental health disorders, English classes for youths aged 18-25, children’s projects at a number of different orphanages and primary schools, and running therapeutic activities such as art, music and dance at understaffed centres for people with special needs. I enjoyed the teaching just as much as I did working in the psychiatric units. Working and experiencing what it is like in a country that is much less well off than ours was incredibly hard to take in and deal with and I think something you can only get to grips with by being out there. Along with the price you pay for being part of SLV you will get the opportunity to work alongside a clinical psychologist, this was by far one of my best days out there but indeed the hardest, it is incredibly different to treatments we would use in the UK and what we learn in lectures. Therapies there are few and treatments are mainly pharmaceutical based. It is hard looking as the way in which we would like to treat individuals and care for those suffering with mental health is much different there, but I will always remember that in my own future work. One problem which is faced there, just as much as it is in the UK, is stigma. A few warnings I would give to anyone who is considering a summer with SLV is to be prepared for the heat. It is like heat I have never felt before. Of course appropriate clothing is required so no escaping the sunbeams by popping on a small skirt or bikini. As well as this, is the public transport which I grew love, there was no such thing as personal space and no such thing as no more room for a paying customer. Be prepared for many sweaty armpits and occasionally having to enjoy the trip on the steps into the bus. I found this, along with the beautiful Sri Lankan food some of the many things that come hand in hand with being thrown in to the roots of the culture, and a culture I truly miss. Anyone asking where you are heading or approaching to speak to you are genuinely interested, they want to help as well as know that you think their country is “lass~n~” (Beautiful in Sinhalese). It is no lie that the placement itself, along with flights and money to spend travelling on the weekends is pushes a tight budget, so my advice would be to save for a good year. I would 100% say the price is worth your experience, with breakfast and dinner included and being cooked by your wonderful home stay parents. In addition to your price you will have the opportunity to attend several workshops, my favourite by far being the meditation and creative therapy workshop. In this workshop we had the opportunity to learn many ways of meditation from a monk and techniques within dance therapy. Other workshops include ‘psychology within a Sri Lankan context’ and ‘psychological healing aspects of issues pertaining to the tsunami, civil conflict and post war reconciliation’. Returning back to England and going into my final year at university I can honestly say that it is the best thing I have ever done and am starting this year with more confidence and knowledge about what I hope to pursue next year. Welcome to the 2014-2015 Academic Year! The Department of Applied Psychology thrives at the start of the new academic year as we welcome new and returning students across our undergraduate and postgraduate programmes. In this post we hear from our Programme Directors about how well the start of the new academic year has gone and what developments are happening across our teaching portfolio. If you are interested in finding out any more about the programmes mentioned then please do get in contact with the Programme Director! “The MSc Health Psychology programme is off to a great start with some really interesting and motivated students from a broad range of backgrounds, all with something interesting to contribute as well as to take away, we hope. We have lots of placement style dissertations lined up, so students can complete research in collaboration with external organisations and help to explore some real world issues. We are also looking forward to talks from a number of external speakers, including some of our own graduates who are now forging ahead with their own careers. “It’s the end of a busy first week, and what an exciting week it has been. Induction has gone really well, with excellent feedback from staff about how new students have thrown themselves into things. It has been fantastic to see second and third years back on campus too, and so it’s always great to welcome new and old faces into the department and feel the excitement and possibility that the new academic year brings. It’s going to be a busy year for the Psychology BSc. We have started to use extensive electronic feedback, which will support students submitting work quickly and easily, then getting prompt and clear feedback from staff. Our work and volunteering placements continue to expand, offering second and third year students opportunities to work in varied settings, develop skills and think about the application of psychology to real world contexts. We’ve also started to plan this year’s undergraduate conference, building on the success of what we did last March (https://psychcardiffmet.wordpress.com/2014/04/03/psychology-undergraduate-conference/) It’s also very pleasing to see how we have such a strong social network presence, using Facebook and now Twitter. I wasn’t so impressed, though, when my colleague Leanne made the most of mobile technologies on Tuesday at the programme welcome (https://twitter.com/PsychCardiffMet/status/514403354165125120). The Welcome Day included a game of Human Bingo, a Campus Scavenger Hunt and Tutorial Introductions with an element of TV’s Would I lie to you thrown in for good measure. Mentors, degree students who had completed the Foundation Programme in earlier years, took part in the games, joining in with tutorial groups and leading them around campus for the scavenger hunt. Prizes, in the form of sweets and mugs, were awarded for the first people to complete the bingo, the tutorial group with the highest score on the scavenger hunt and for those tutorial groups who correctly identified their peer’s bogus information. The day finished with short talks form the pathway leaders of the degree courses onto which the programme leads and the opportunity for all new students to ask questions of staff.